Many types of tea are made from the leaves of the camellia shrub with the botanical name of Camellia sinensis. The different types are due to the different ways of processing, fermentation and oxidation of the leaves. Camellia teas include black tea, green tea, oolong tea, pu’er, and white tea. All forms of tea contain a rich supply of polyphenols, although green tea has higher amounts and is overall considered the most medicinal. All forms contain folacin (one of the B vitamins), vitamin C, fluoride, and magnesium. It is important to note that adding milk to tea eliminates the antioxidant powers of tea. Tea affects the central nervous system mostly through theophylline (although it also contains caffeine and theobromine). Different forms of tea have a varying degree of these stimulants. Also, tea contains tannin (from 5-20%), which is a known growth depressant and should not be given to children. Excessive tea consumption can also deplete iron. Drinking tea is not recommended for people with a tendency towards forming calcium oxalate kidney stones. Black tea is the most popular tea throughout the world and has been consumed for ages. Black tea is wilted (by air), sometimes crushed or pounded, and then allowed to fully oxidize. Unlike the lighter teas, black tea can maintain its flavor for years and is easier to keep and store. Black tea has higher caffeine content and less anti-oxidants. Western medicine claims that black tea is just as good as green tea in the battle against cancer, certain viruses, tooth decay, and arterial health. Most people add milk and sweetener to soften the taste, which reduces the medicinal value. In Chinese Medicine, black tea is considered warming and stronger, so it can be diluted if necessary. It is still considered to have medicinal properties although it is not the preferred form of tea in China. Black teas are not as popular as greens or oolongs and are considered inferior in quality. Green teas are picked from spring to late summer and then either steamed or pan-fried and dried to maintain both their color and nutrients. There are many kinds of green teas with different flavor profiles depending when they are picked and how they are treated. Overall, green teas have become well known for their use in the prevention of many diseases as well as the nutrients they carry. According to Asian medicine, green teas are cooling and can clear heat, aid with digestion, sharpen the mind, and help slim the body by carrying out excess fats and oil from food. 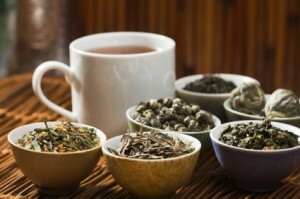 The amount of caffeine varies among green teas, but it is higher than in white teas. Oolong tea is picked, allowed to dry until it is semi-fermented, and then charcoal dried. To get the slight fermentation, leaves are bruised and allowed to oxidize for different periods of time (about 2 hours for the most mild Chinese oolongs and longer to get richer oolongs). To stop the leaves from oxidizing more, they are wok fried quickly; some oolongs are fried more than once. Because of this processing, there are many different kinds and flavors of oolongs, ranging from almost green to almost black. Oolong teas have acquired a reputation for being a miraculous tool in weight loss and beauty, but in reality work in a similar way to green tea in helping carry excess fat and oil from the body. In terms of anti-oxidants, oolongs have a decreased amount in comparison to green tea. Oolong teas are more warming than green tea, especially if they are more fermented and fried for longer periods or more than once. Similarly to green tea, oolongs are often times taken with meals to ease digestion. Personally, I drink a lighter oolong tea in the winter when I feel that it is too cold to drink a true green tea. Pu’er tea is traditionally made from the big leaves of specific type of wild tea trees that grow in the province of Yunnan. It is often referred to as post-fermented because it is allowed to age for a period of time after the tea has already been fully oxidized (anywhere from 1-50 years; there are Pu’er cakes today that are dated to the Qing dynasty!). Pu’er keeps amazingly well and is often times packaged as a cake to store and ferment. Western medicine claims that pu’er can lower cholesterol. In China, pu’er is used to treat hangovers because it is said to inhibit dampness and aid the spleen as well as reduce heat in the stomach and descend qi. White tea is made from the premature leaves plucked in the spring. It is considered to be one of the most natural forms of tea, since it is handpicked early in the spring and is not fully fermented or aged. It is very delicate and contains the lowest amount of stimulants, which allows it to be enjoyed both during the day as well as at night. It has a reputation for containing the most antioxidants of any tea. It is cooling and light. According to Asian tradition, tea should be lightly seeped and infused several times (in comparison to the European way of brewing one batch for a long time). This process helps remove the tannins, and brings out the delicate flavors of the tea that do not come out in the first infusion. However, strongly brewed tea can be used for acute diarrhea, and either acute or chronic inflammations of the digestive system. Used in this way, one strong tablespoon several times a day is more appropriate. Topically, strong brews and poultices of tea leaves can help with poison oak outbreaks and to dry up a herpes breakout. Most of this information comes from Healing with Whole Foods by Paul Pitchford. Some comes from The New Whole Food Encyclopedia by Rebecca Woods. Thanks to Natalia Schyfter-Camacho for your help with this article. Written by Lana at 9:33 pm and filed under All About Herbs, Foods, Drinks, Recipes, Healthy Lifestyle, Miscellaneous. Red raspberry leaf tea remains a favorite folk remedy for a number of health issues.Cool raspberry leaf tea is a traditional remedy for cold sores, fever blisters and sore throats. I wonder if there is somewhere in the Davis area to find pu’er. We have an Asian market maybe they have it there? look your post. Thank you so much.